Keel-billed Toucan, Rainbow-billed Toucan (Ramphastos sulfuratus) is a native of Central America, ranging from southern Mexico south to northern Colombia and northwestern Venezuela. 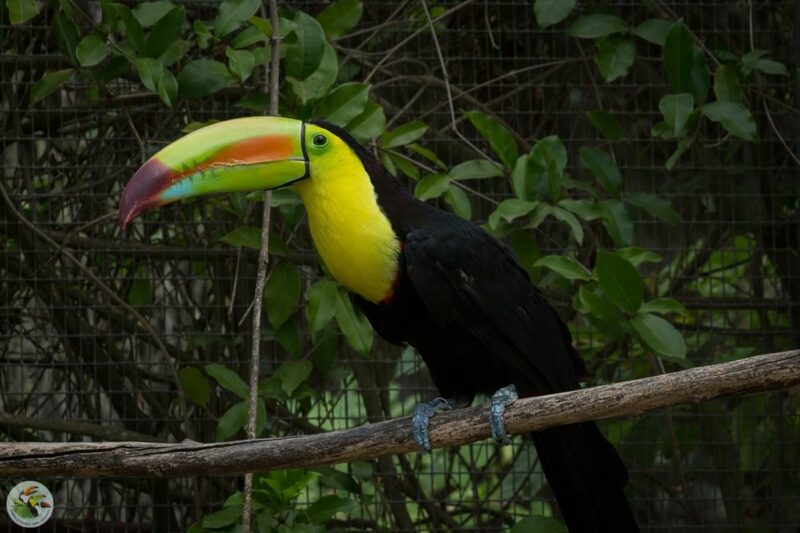 It is smaller than the Swainson or Toco toucan weighing at 400 grams, with a beak length of only five inches. Nevertheless, it’s very colorful beak lends it a clownish appearance, and it is often referred to (erroneously) as the Fruit Loops bird. The Keel Bill has enjoyed great popularity as both a zoo bird and as a pet, because of its colorful bill. It is an intelligent bird, and easily trained. In Belize, Guatemala and Costa Rica, people often keep them loose around their homes, where the birds are free to come and go. Near San Jose, Costa Rica, there is an outdoor restaurant (Las Orquideas) where Keel Bills visit the guests in search of handouts from their dinner plates. First captive breeding 1976; Houston Zoo. Subscribe to our mailing list to get monthly updtes on available birds and discounts! ©2017 Emerald Forest Bird Gardens.